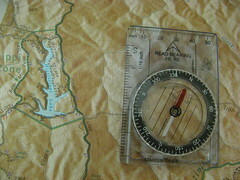 For hikers, a compass is like car insurance: you never need one except when you do. Say you’re going uphill into a fog bank and suddenly you lose all visual references of your location. You’re flying blind now. Then the trail splits. Which way to turn? Novices who’ve just tossed their shiny new compass in their pack think they’re covered till they break it out in the middle of said fog bank and realize they have no earthly idea which way to go, based on what that little floating magnetic arrow is telling them. So, it points north. Then what? How to take a bearing: all this means is looking straight ahead and figuring out where you’re going, relative to magnetic north. Combining a map with a compass: This is your only sane option in the aforementioned fog bank. You put your compass on the map to find a heading telling you which way to turn (this is why most compasses are transparent). A site called Compass Dude has all you need to know about the specifics of reading a compass. Check it out, then get out there with a map and see how it all comes together. Once you’re good at it, you can get into orienteering — the sport of finding one’s way without trails. Steve Sergeant at the WildeBeat has this intro at his podcast. Subscribe to comments with RSS or TrackBack to 'Compass basics'. That is a great website. Thanks. Actually, orienteering is not just for the advanced navigators. It’s a great way to learn navigation in the first place. You can participate in a while-level orienteering course with no more knowledge or experience than the beginner’s clinic they offer at most orienteering meets. There’s an orienteering meet in the bay area at least 3 times each month. That’s a lot of chances to practice. I love the tips here. About a month ago I bought a compass just in case I needed it. I haven’t used one since I was a kid, and was unsure if I was using my new one correctly. This article and the links helped me be sure, and I learned even more. Up until now, my hikes have been relatively short. But just yesterday I went somewhere new and bigger, and found some use for my compass, and the information I learned here. I’ve found that if you start navigating only after you realize that you’re lost, it’s likely to be too late. Even when you think it’s going to be an easy trip staying aware of where you are is important, and can help keep you engaged with your environment too. Put topo map in my pack’s belt pocket and compass around my neck and started up Mt. Shavano in darkness. Followed my dog Dudley and he got sidetracked and suddenly we’re lost. Got out the compass and map and just stared at them. there were no landmarks visible in the night. Didn’t even have a clue how far we’d hiked. Nothing around me but lots of trees and total darkness. I’d broken all the rules and there I was. Brilliant idea, we’d been going up all the time, so I faced uphill and did a 90 degree left turn and walked, across the slope. Came to a big drop off which I had not seen before, so turned 180 and went the other way across the slope. Stopped suddenly, turned around, went 15 ft. back and I was on the trail. Just luck. Now I consult my map and compass from time to time to establish where I am. And I don’t blindly follow Dudley, he was probably following a squirrel. One last point, some hydration bags have a rare earth magnet to connect the drinking tube to the pack’s sternum strap. Keep your compass near that magnet long enough and it can swap polarity. Happened to me, compass said North was South and South was North. Fortunately it didn’t take me long to figure that out. Just remember that the sun rises in the East — or is it the West?